Dermatographism is a skin condition that affects 2 to 5 percent of the population and can be best described as skin writing or skin drawing. Dermato refers to the skin and graphism to writing or drawing. Friction of the skin causes raised red and itchy lines in the pattern of the irritation. 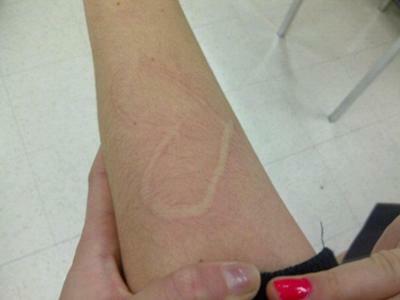 In other words, if you use an object (such as the end of a spoon handle) to write your name on your arm without too much force, the result is the appearance of your name on your skin in the form of itchy raised red welts. This occurs within a couple of minutes or less. Another example is light scratching of the skin. This results in the appearance of dramatic looking red and raised marks on the skin, indicating exactly the pattern of the scratching that occurred. Dermatographism is not a serious condition. However, because this skin problem can be very uncomfortable, annoying, and stressful for individuals, it may lead to deterioration of general good health if left untreated. Redness caused by stroking of the skin is not unusual. In fact, for 25 to 50% of the population, firm stroking will produce some sort of a red mark. However, this is not dermatographism because the skin only becomes red and not raised or extremely itchy. Dermatographism is categorized as one of the several types of urticaria. Urticaria is a general term used to describe a skin condition that is characterized by the development of various types of extremely itchy and red welts or hives on the skin. These hives may appear on any part of the body. Urticaria results from a hypersensitivity reaction of the skin after the individual has been exposed to an allergen or an antigen. This causes a release of histamine leading to the welts and hives, swelling, and itching. Dermographism is a physical urticaria with a specific set of symptoms that separate it from other types of urticaria. Diagnosis of this skin problem can be difficult as illustrated at the dermatographism diagnosis page. Dermatographia can also be associated with the other physical urticarias as described at the “types of urticaria” link above. Occasionally these physical urticarias are referred to as different types of dermographism. Dermographism pictures can he used to help diagnose this skin problem. The challenged faced by individuals with this skin condition is that it is difficult to determine the actual causes of why the skin has developed this skin writing problem. There are a variety of possible causes for dermographism, but it is often difficult to verify which may have lead to the development of the condition. Additional all natural treatments can be found at the following link: natural antihistamines. Remember these treatments do not cure dermographism, but help affected individuals proceed with their daily lives with less discomfort. For a past and on-going account of one individual’s battle with this skin writing disease, please visit the possible dermatagraphism diary. You can also share your own story about battling dermographism by visiting this page. If you would like to read about other people's experiences with this skin condition, as well as questions and answers relating to dermographism, please go to the Dermographism and Hives – Questions and Answers page. Please be sure to visit the dermographism causes survey page and the survey results page. Visit this page for information on the DERMOGRAPHISM eBOOK.